The room service menu at Manhattan’s James Hotel doesn’t look unusual at first glance. Spicy meatballs and a gorgonzola-walnut salad share the menu with packaged items such as mixed nuts and granola. But read the fine print. Every item on the menu is infused with cannabidiol, better known as CBD, one of the many cannabinoids derived from pot. It’s known for its therapeutic effects but isn’t intoxicating like pot’s most famous compound, THC. How did weed end up on the menu of a trendy SoHo hotel in New York? Or across the country at The Hollywood Roosevelt Hotel where guests imbibe on CBD-infused popsicles, desserts and cocktails by the multi-million-dollar, David-Hockney-painted pool? It’s also infused in coffee and hot chocolate at cafes in Portland, Oregon. Hospitality’s dive into CBD is part of a booming economy that has transformed the compound from a little-known pot derivative to the heart of an almost-billion-dollar industry. CBD’s legality exists in a gray area amid the federal prohibition on pot and a maze of court cases and federal regulations. 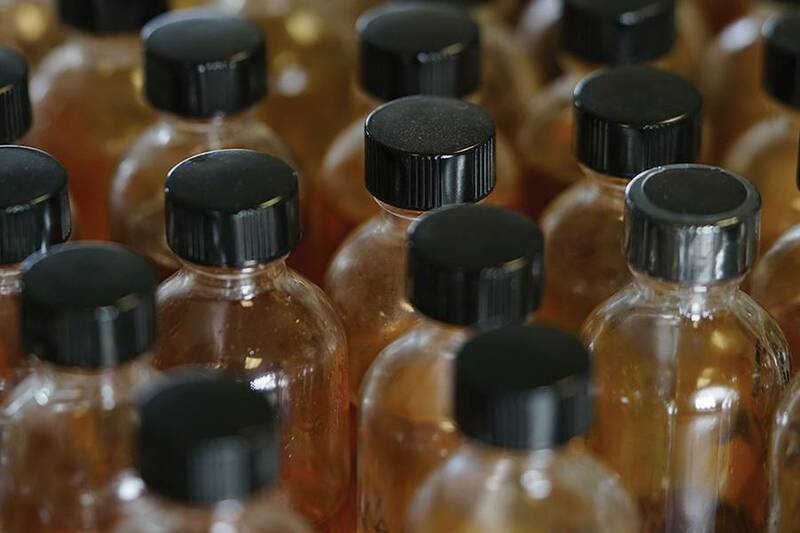 But that hasn’t deterred entrepreneurs from selling just about every imaginable CBD-infused product, from oils and tinctures to drinks, sweets and sweeteners. And that’s just CBD for human consumption. Skincare, pet food and even vaginal suppositories are riding on CBD’s curative attributes. Companies are eager to cash in on this trendy compound, sometimes even peddling products that contain far less CBD than what is advertised. There’s almost no regulation on most CBD products, leaving customers to sort out whether they’re buying the real stuff or snake oil. Fact-checking CBD’s therapeutic effect on specific conditions is equally challenging. The science behind how CBD affects our bodies is still not well understood, although evidence shows it can have anti-inflammatory and anti-anxiety effects. The federal government recently approved the country’s first cannabis-derived drug—a CBD solution to treat epilepsy—but that doesn’t mean sufficiently researched efficacy for other conditions. For a drug that doesn’t produce a high, the country is delirious over it. CBD is riding a wave of popularity and awareness fueled by consumer interest in wellness, mistrust of profitdriven big pharma and the legalization of cannabis. It’s also unintimidating—on it’s own CBD doesn’t offer THC’s high. These cannabinoids interact with a neurological system in our body called the endocannabinoid system, but they behave in fundamentally different ways. THC gets humans high by binding to two receptors scientists refer to as the CB1 and CB2 receptors. CBD, on the other hand, appears to interact with these receptors in ways that diminish THC’s ability to bind to them, meaning CBD not only won’t get you high, it will likely make you less high. While CBD can’t bind to the THC receptors, scientists have discovered a wide range of pathways it can operate on, giving it an extensive list of therapeutic possibilities, from treating arthritis and anxiety to seizures and depression—without an intoxicating effect. How much CBD do you need to feel its effects? That’s a bit of a guessing game that can be resolved through trial and error, thanks to a dearth of CBD research. Most of the clinical research has been conducted on effective in reducing epileptic seizures. In fact, the Food and Drug Administration in June, gave final approval to Epidiolex, the CBD medication that treats two rare forms of epilepsy, for patients starting at age two. CBD’s benefits are made even more complex by its interaction with other compounds found in pot. Cannabis advocates recommend using the whole plant instead of just isolating CBD for use—those other cannabinoids such as THC and pot’s aromatic terpenes can work together to have even more powerful therapeutic effects. The call for larger and more extensive clinical trials have been hampered by cannabis’ federal Schedule I status, the most restrictive level of illegal drugs reserved for chemicals that have no medical use. Epidiolex is challenging that designation with clear medical results, and in doing so, might have a hand in making CBD from cannabis legal, not just industrial hemp. What’s really in your CBD product? Cannabis can’t be served at restaurants or any other type of hospitality-related business even in fully legalized states. So how can any business serve or sell CBD products? The common answer is that CBD is “legal in all 50 states,” but that isn’t accurate, according to Daniel Shortt, an attorney specializing in cannabis and industrial hemp for the law firm Harris Bricken in Seattle. Anything derived from cannabis, including CBD, is illegal, according to the Drug Enforcement Agency (DEA). Some hemp industry companies challenged this interpretation, arguing the DEA overstepped its authority because Congress hasn’t expressly made CBD illegal, but a federal appeals court ruled in the DEA’s favor in early 2018. However, companies have found CBD sources that don’t fit into the DEA’s definition of cannabis, giving them a way to skirt around the law. For example, industrial hemp, a legally distinct variety of cannabis, is allowed as long as the product contains no more than 0.3 percent THC. That distinction means the CBD inside these plants is not necessarily illegal, but only industrial hemp grown with a permit from a federally authorized pilot program is considered a legal source, according to a 2016 court ruling in the U.S. Ninth District Court. Many companies bypass the difficulties of finding approved U.S.-grown hemp by importing CBD from international sources. There’s plenty of CBD and hemp grown outside the U.S.—China, Canada and Europe all have robust markets—but the DEA says CBD can only come from the stalks and seeds of these international hemp plants, not the plant’s flowers, where the vast majority of the compound is stored. Not all CBD companies are complying with these DEA rules, but the federal government hasn’t taken a heavy-handed approach to enforcing them, according to Shortt. And CBD appears to be on the verge of becoming legal. The DEA said they are now reviewing CBD’s Schedule I status in light of the FDA-approved Epidiolex. Senator Mitch McConnell also has been pushing to fully legalize hemp and all of its non-THC components. And the greater cannabis legalization movement is gaining steam, meaning there’s a multitude of ways CBD could become legal before the end of 2018. Rush Matt Karnes, an investment analyst and founder of GreenWave Advisors, said the CBD market is likely to grow from around $200 million this year to over $3 billion by 2021. One company that’s running ahead in this CBD rush is HempMeds, which expects to sell $40 million in CBD products next year, according to its CEO, Stuart Titus. Not all of the companies are ethical, according to Martin A. Lee, a journalist and author who has been covering medical marijuana for over two decades and founded the nonprofit advocacy group Project CBD. There’s data to back up Lee’s claims. A research letter published in the Journal of American Medical Association in 2017 found that out of 84 CBD products purchased online, only 30.95 percent contained the claimed amount; 42.85 percent had less CBD than advertised and 26.19 percent had more CBD than what the label stated. Word of caution: 21 percent of the products had significant quantities of THC. Creating a CBD oil, butter or other infusion to cook with isn’t necessarily the best way to avoid mislabeling. Finding a source of CBD-only material without residual THC, is extremely difficult. That’s why Andrea Drummer, director of food and beverage for Elevation VIP Cooperative and the chef who created the CBD menu for the James Hotel, recommends using a CBD-tested product that can be added to food, such as an oil, honey or tincture. “Just to be able to talk about it and introduce the language on the East Coast is exciting,” says Drummer, comparing New York to her Los Angeles base—which, like the rest of California, became fully legalized for pot earlier this year and has been legal medicinally since 1996. If the public can see how CBD can help, maybe they’ll see the promise in cannabis overall, she says.